If you’ve been following my journey, you probably know by now that I would never be an advocate for digging yourself deeper into debt. While this is true, I’m still a realist and I understand that life doesn’t always give you the time to get right with your finances before you find yourself neck-deep in a big, fat, financial emergency. These emergencies are a big part of why financial institutions offer small loans; to help get through those hurdles life throws at you. 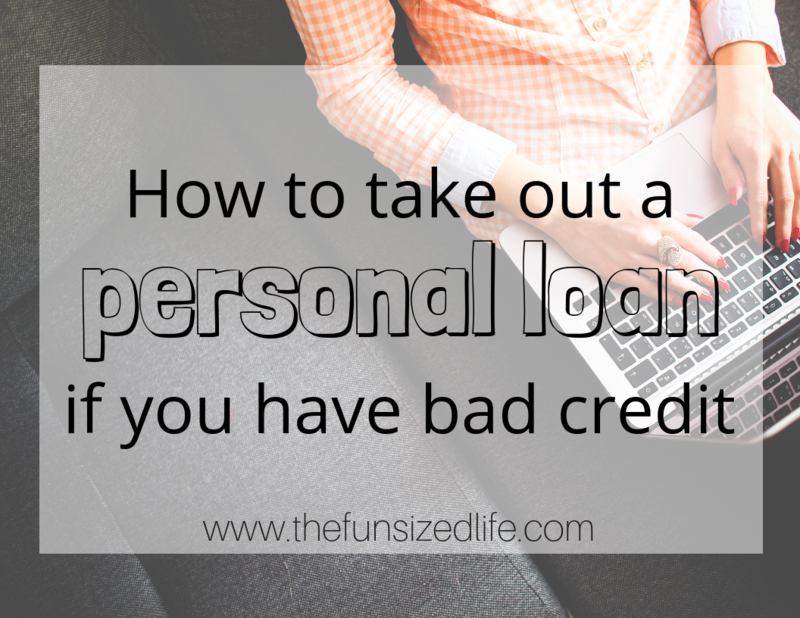 If you are struggling to get ahead and think you might benefit from taking out a loan let me tell you how you can take out a personal loan even with bad credit. Small personal loans are loans where you are borrowing significantly less money than larger, more common loans like a mortgage or student loans. These small personal loans often fall between the more minimal price range of $500 – $5,000. Because of the smaller loan amount, you will usually see a shorter loan term as well. That means instead of spending years making payments, you may have only 2. Personal loans are generally given when people are going through tough times in order to help them stay afloat and are used for emergencies when people don’t have enough savings to cover their expenses. This is what they are most often used for, but there are also a few other benefits a small personal loan can offer you. If you are not sure what your credit score is, there are a few sites that will give you a credit check for free. The Credit Pros – Learn not only your credit score but what is wrong with your credit and get help repairing it. MyFreeScoreNow – Check all three credit scores here and get your report in seconds. MyFico – Get help monitoring your credit and your identity to qualify for lower mortgage rates, better credit card rates, and lower auto rates. Learning your credit score and getting help with improving it can help you tremendously. Although it is not necessary to have an outstanding credit score to get a personal loan, it is helpful. Need help improving your credit? If you think you have some marks on your credit report that could be disputed, check in with the Credit Assistance Network and get a FREE credit analysis. In order to qualify for a small loan, there are a few things you’re going to need before you get started with the application process. When giving out loans, credit companies may be willing to work with you even if you have bad credit as long as you can demonstrate your responsibility. It’s safe to say that companies are willing to work with low credit scores, but do not want to work with people who they believe will struggle to make payments. This is beneficial to both the borrower and the lender. If you are already struggling financially, it would not be a smart move to dig yourself into deeper debt. The application process is relatively quick and painless. From there you will be able to go through the loan application process with some basic information about the loan amount and type as well as some banking information. If you are approved you can receive your funds in as little as a day. Even though you may qualify for a lower interest rate, it’s still beneficial to you and your finances if you can work to pay off your personal loan quickly. My top recommendation for paying of personal loans and all other debt is to use the Dave Ramsey Debt Snowball. Our family used this method and were able to pay off $6,000 of debt in only 6 months. Once your smallest debt is paid off apply that $200 plus the minimum payment to your next smallest debt. Continue this process until all of your debt has been paid. Like I said, this method worked wonders for our family and is laid out in Dave Ramsey’s Baby Steps. If you are needing funds fast and don’t believe you’ll qualify for a loan, my best recommendation is to find ways to earn that cash and fast. I am a strong believer in the major results of a little side hustling. QKids – Teach English online while you earn your degree. SayABC – Earn up to $21 and set your own hours teaching online. VIPKid– If you have a bachelors degree you can start teaching online up to $22 per hour. Uber – Driving for Uber offers flexibility, great benefits and you can get paid up to three times per day. UberEATS – Get the same benefits as Uber except you can deliver food instead of people with UberEATS! No matter what the case, or what your circumstances, your financial destiny is in your hands! Don’t let bad credit discourage you and don’t let a few mistakes set you back forever.